WASHINGTON (WLS) -- Montreal-based Expresco Foods, Inc., is recalled over 20,000 lbs. of imported chicken skewers that may have been contaminated with listeria, the United States Department of Agriculture said. 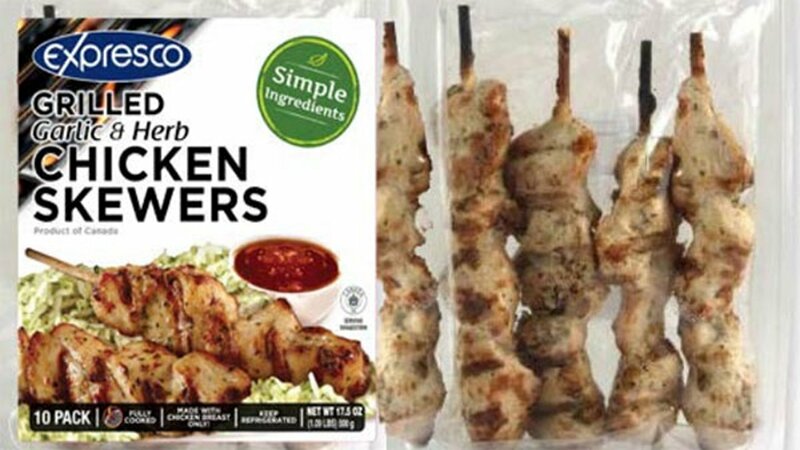 The recalled skewers are "West End Cuisine Grilled Mediterranean Style Chicken Skewers Hand Made with Chicken Breast" with UPC code 621588314947 with lot codes 172562, 172571, 172640 and 172704, and "Expresco Grilled Garlic & Herb Chicken Skewers" with UPC code 621588315555 with lot codes 172563, 172668, 172669 and 172670. The affected products also bear establishment number "36" inside the Canadian Food Inspection Agency mark of inspection. They were shipped to Illinois, Arizona, Florida, Maryland, Connecticut, Michigan and Texas. The USDA said an import inspector detected the problem during a routine inspection of foreign shipments. Listeria bacteria can cause listeriosis, a serious infection that can be fatal in older adults, persons with weakened immune systems, and pregnant women and their newborns. Symptoms include fever, muscle aches, headache, stiff neck, confusion, loss of balance and convulsions, as well as diarrhea or other gastrointestinal symptoms. In pregnant women, listeriosis can cause miscarriages, stillbirths, premature delivery, or life-threatening infection of the newborn. If you have purchased these products, you should not consume them. Throw them away, or return them to the point of purchase.